Cedric Gracia has turned up to Sea Otter with the latest version of his Forestal Bikes e-Bike prototype. Take a look! Chipps is out at Sea Otter this week where he is getting the low-down on what’s new in the world of MTB. We might not all be at Sea Otter lapping up the sun and mingling with the mountain bike royalty though, but we can stalk everyone on Instagram, which brings us to this. Screenshot from Cedric Gracia’s Instagram story. 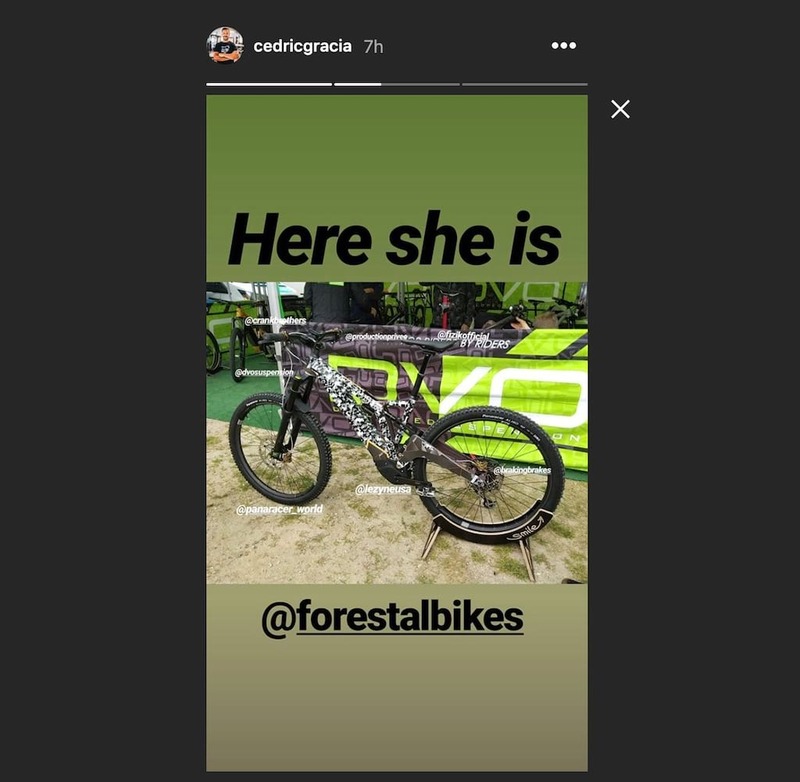 Cedric Gracia’s much talked about, but highly secret, Forestal Bikes e-Bike prototype has turned up, and it looks like a more refined version of the bike we wrote about here, it also confirms that CG’s new bike is, in fact, an e-Bike. While we only have a screenshot of an Instagram story to go at for the moment, Chipps is on the hunt for an interview and more photos, but this is still the most detailed look of the innovative bike to date. Compared to the earlier version, this Forestal Bikes e-Bike prototype is more refined and it looks as though the large power button and charging port have been removed from the left-hand side of the downtube. 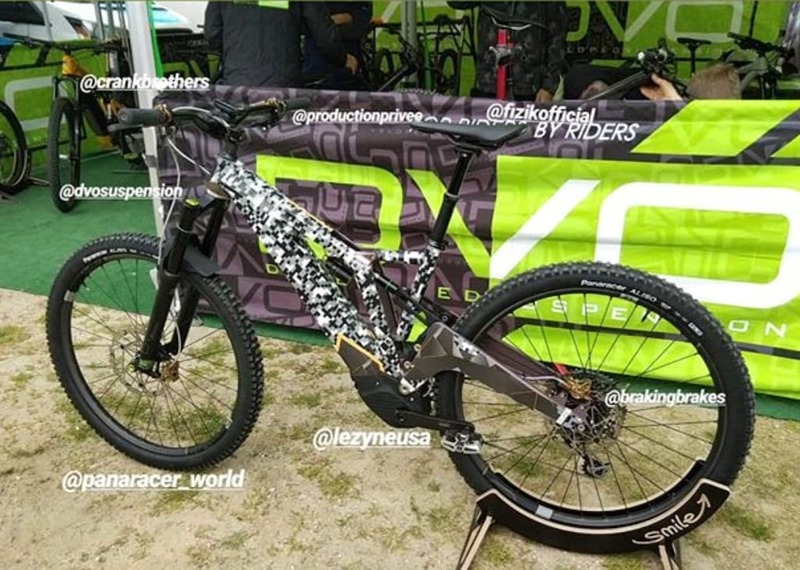 The camo finish now extends to cover the seat tube/tower portion of the frame too, hinting that this bike might be closer to production than the earlier steel version. Looks like a Sess….. Orange! The camo stretches down the swingarm of the bike to a distinctively Orange-esque swingarm and although on first glance it might look like a simple single pivot suspension design a closer inspection reveals some sort of linkage arrangement. Hopefully, we’ll have clearer images to goggle at soon. Interestingly the only section of the prototype Forestal Bikes e-Bike not disguised is the motor. The compact drive system looks to be of similar proportion to a Shimano STEPs E8000 motor, but we’re not sure if it is possible to locate the main pivot so close to a Shimano motor. It’s could be that this is a custom designed motor solution either by Brose, or perhaps this is the first look at the new Bosch CX power unit? It’s also not clear in the screenshot if the mainframe is still made from cast alloy. Looking at the inside of the frame the material seems much darker than before. This could simply be a shadow or it could be a switch to a carbon front triangle. Other than those details the only other interesting feature we’ve spotted are the Italian made Sunstar Braking disc brakes, not a brand we’re too familiar with, but this motorbike brake manufacturer appears to be zeroing in on the eBike market so expect to see more of them in the future. Keep your eyes peeled for more news from Sea Otter, and more Forestal Bikes news.